I think we have created a monster. I picked up a paintbrush for the first time in years. And I liked it. a lot. 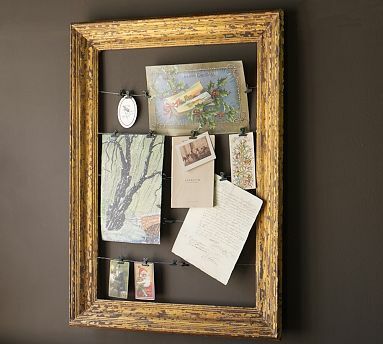 In fact, I've been wandering the halls of my house warning the mismatched picture frames that they're next. As soon as I saw the Pottery Barn catalog that came out a few weeks ago, I started ripping pictures from it, storing ideas of things I wanted to knock-off for Christmas decor. I shared some of those ideas here. But with a hefty $200 price tag, I knew it was something I would never own. Then I looked to my right and saw a picture frame hanging on the wall. Sure, it had a picture in it, but this frame was just begging to be transformed. So I did. I am so excited about how this project turned out. It's the first "big" project I've taken on in a long time. First I sanded it down, not wanting to completely lose the dark color. Next, I painted the frame Cottage White. I used a couple coats of Behr's Primer Paint (I actually bought a sample size for $2.94) and it worked great! Once it was dry, I distressed the frame using both coarse and medium sandpaper. Then I was ready to attach the wires. I purchased a picture hook kit at Home Depot that included picture wire, sawtooth hangers, picture hooks, and screw eyes for around $4. I screwed in the eyes evenly spaced on the back of the frame. Then I doubled up the picture wire, looped it through the eye and twisted it to secure it, making sure to hold it as tight as possible. I kept the original hanger, and just screwed it back into the frame high enough and tight enough that once it was hanging it wouldn't be seen. I hung it on the wall, and stood back to admire my work! The entire project cost me about $7 for the paint and the picture hook kit. That's $193 cheaper than Pottery Barn!! My original intention was to use it to display Christmas cards. But then I thought it might be a great thing to leave up year round to use as holiday decor throughout the seasons. I think that my favorite idea though, is to just hang a few black & whites on it. Make sure to check back on 11/11 when I'll be posting a GIVEAWAY for personalized printables! What a great idea! And so easy! Thanks for sharing this! new follower by the way - love love love your blog! adding this to my 'to make' list! Love it with the black and whites! such an awesome project & great result! might be nice to convert into an advent calender for Christmas :) Thanks so much for sharing & for your sweet comment! Fabulous, Kristin! I love it. The color is perfect... even better than the original! Nice work! Hi, I am just visiting from New Friend Friday and I love your blog. I am now a follower. looks great! Very nice idea for the Christmas cards, you could always change it up for the seasons? Here from NFF, have a happy Friday! I think I would hang my boys art work on it. I thought the same thing when I saw the PB catalog and long before I saw your post, I have my project qued up for the next thing to be done! I can't wait! You did a great job! What a cute idea! I'd like to try it. Thanks for the inspiration! I saw this in their catalog. You aced girl! Such a nice addition to any year round decor! Kudos to you. That's so cool! I think I need to make one. BTW, I host a PB, Ballard, Restoration Hardware Knock-Off party once a month...this would be a great entry if you're interested. Next party is Nov 18. I love it! I will have to scour Goodwill for a perfect frame because I will be using your idea! Gorgeous! I saw those and thought,what! The want how much? Love it! On my way to the basement to find a frame! Oh gosh that is adorable! Im going have to make me one of those! Still lovin' it! So glad you joined the party! But please add my link to this post, k? Thanks.